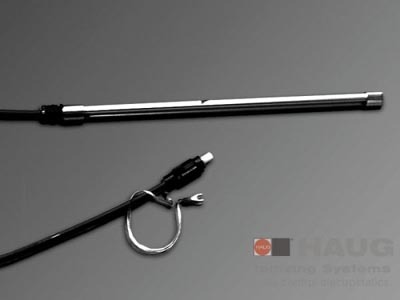 The ionizing bar EI VC is characterized by all quality features of HAUG ionizing bars, including the patended contact system X-2000, which can be easily dismantled, the shielded and EMC compatible high-voltage cable, the absolute safety to touch and the special stainless steel electrodes. The high-performance ionizing bars EI VC enrich the laminar air flow with positive and negative ions. Existing or generated charges are thus eliminated and the build-up of charges is prevented. As a result of the minimum particle emission values, the EI VC is suitable for use in rooms with “ISO Class 4” in accordance with DIN EN ISO 14 644-1. This corresponds to the withdrawn US Federal Standard 209E “Class 10”. Its light, aluminum-color profile ensures good visual integration in clean rooms. The ionzing bar EI VC has been qualified by the Fraunhofer Institute for Manufacturing Engineering, Stuttgart (Germany). EI VCA without HV-cable, suitable for connecting a highly flexible, detachable HV-connection cable (type HVK Flex). EI VCE inseparable HV-cable to the power pack, detachable HV-cable on bar for series connection of ionizing units. EI VCAE detachable HV-cable to power pack, detachable HV-cable on bar for series connection of ionizing units. The ionizing bar EI VC is a high-performance ionizing bar which exerts a load to the power pack of 3x the capacity (3x length of high-voltage cable). The ionizing bar length must therefore be multiplied by 3 and then added to the length of the high-voltage cable. Any one of the power packs EN 8, EN 8 LC, Multistat, EN 70 or EN 70 LCcan therefore be selected.